Protect your business with a premier-quality commercial gate installation service from the region’s number-one in bespoke security solutions. Proudly serving commercial and industrial customers across the locality since 2005, 1st Choice Security Systems has developed a reputation that goes above and beyond other Chelmsford commercial gate installers. If looking for a commercial gate company for Essex that takes your safety and security as seriously as you do, reach out to a member of the 1st Choice Security Systems team to arrange an obligation-free quotation. When it comes to overall crime rates and prevention, Chelmsford is neither the strongest nor the weakest performer in the region. Just as is the case with the wider locality, antisocial behaviour, theft and violence continue to perpetuate as Chelmsford’s most common crimes. The crime rate may not be excessively higher than elsewhere, but this doesn’t mean it’s a good idea to take things for granted when it comes to security. 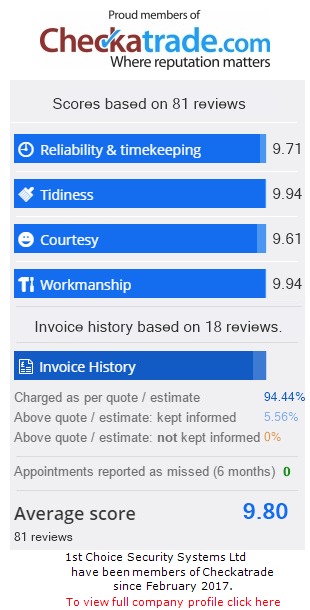 Having been designing and installing automatic gates in Essex for more than a decade now, we know exactly what it takes to exceed the expectations of every business we work with. We understand the importance of delivering the total package of affordability, reliable performance and the kind of peace of mind every business owner needs. Rather than providing generic security solutions for industrial and commercial clients, we go the extra mile to deliver uniquely capable commercial gating systems. If you’d like to learn more about any of our products or services, the 1st Choice Security Systems team is standing by to take your call. What sets us apart from most Chelmsford commercial gate installers is the way in which we specialise exclusively in 100% bespoke security solutions for every business we work with. We fully understand and acknowledge the fact that as no two businesses are identical, the same can also be said for gating and security requirements. Rather than offering a fixed range of products and services, we instead meticulously tailor our gating systems in direct accordance with the requirements and budgets of those we work with. We can provide you and your business with a high-end gating system that combines unbeatable performance with aesthetic prowess in equal measures. We know exactly what it takes to design and install gating systems that are both fundamentally secure and bring an additional visual accent to your property’s exterior. What’s more, irrespective of the unusual or awkward nature of your premises, we can create the kind of secure gating system that fits your requirements flawlessly. Operating as an ISO9001:2008 and Safe Contractor approved company, we take enormous pride in being one of the most trusted and recommended companies of our kind currently operating in Chelmsford. We can guarantee you and your business a no-pressure, obligation-free experience from start to finish and the promise of our 100% independent and objective support at all times. For more information on any of our products or to arrange a quotation, get in touch with a member of the 1st Choice Security Systems customer service team today. We install Automatic Gates in Chelmsford & across the rest of Essex, including Epping Forest, Brentwood, Basildon, Chelmsford, Colchester, Castle Point, Rochford, Maldon & more! For more information on any of our products or services, get in touch with the 1st Choice Security Systems team today on 0800 118 2414. In need of CAMESAFE Chelmsford Commercial Gate Installers?